I have been so thrilled by the Tom Reiss biography The Black Count, that I had to write about it. I always knew Alexandre Dumas the novelist, that's him above, was mixed race. I didn't know that his contemporaries, Balzac included, said dreadful things about him - jealousy about his sales I expect. But I never knew anything about his father. When I was a kid I loved The Three Musketeers. Not the novel you understand, but the Saturday morning cartoon which featured on Banana Splits (alongside 'Size of an Elephant!' Shazam, if you remember) . I also loved the Count of Monte Cristo, again not the novels, have you seen how fat it is? (It is very hard to hold so I had to wait until I had an e reader) But I loved several films and radio plays. there is a rather super adaptation on now it is fab. BBC Radio 4. I loved the injustice, the wrongs righted the world turned upside down and set back again, the camaradie of the Musketeers - D'Artangnan - the movies with Michael York and Oliver Reed. And you know, you know what? I am there. I was there all along. I so wanted a frock like Milady's I so wanted to be able to ride like the musketeers, do that thing, you know, is it Athos? Porthos? (Sadly Aramis only conjures up over aftershaved boys from the early 70s) the one who can ride under a beam and pick the horse up with his thighs? I managed to grow my thighs to the right size but never figured the strength. Anyway, all their feats of derring do of flashing blades and the fight for right - you know where those stories came from? This guy. 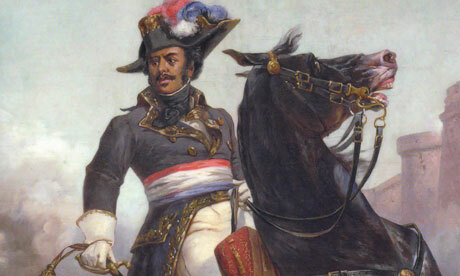 This guy on his horse, the 6ft flashing blade and Brigadier General of the French Army, who fought for Louis XVI, who fought at the heart of the revolutionary army, the guy who terrified Napoleon and led a post revolutionary France into the nineteenth century. 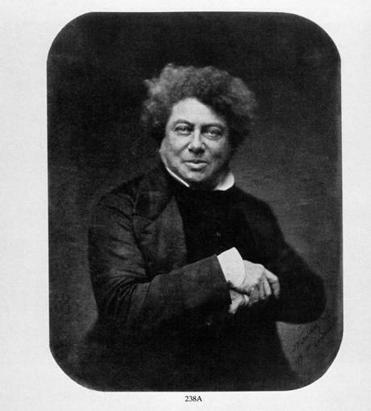 the son of a Marquis and a slave - Alexandre Dumas. argue with his skill with a sabre or in battle. I cannot begin to tell you of this man's epic, storybook life. Even his early years on Saint Domingue, before his father - the Marquis - sold his Mother and siblings and pawned young Alexandre before sending for him and sending him to the swishest school for young gentlemen in France - are incredible. The book, which I knew nothing about, was serialised recently - I thank you again BBC Radio 4 - and I was transfixed. I've only just begun to read the book myself and it is a humdinger of a tale, and also fabulous reference for my own dear Ezra McAdam, young surgeon, who is about to set foot in revolutionary France. The attitude to colour in 18th century France is just as outlandish and twisted as it was here, where a man like Alexandre Dumas could be both a Count, yet not able to use the prefix 'Sir'. Where everyone was equal, except anyone with African blood. Alexandre Dumas flourished in the brief window of freedom the revolution offered, yet never once lost his humanity. I am utterly and completely swept away by this lovely history. Can you see how much it means to me, a middle aged woman living in London, to discover this man? Why didn't I know about him already? Thank you Tom Reiss and your wonderful book. I've been listening on the BBC too, and have been transfixed! Thank you so much for the post and the pictures. Brilliant! I've also grown up on the films and never read the books - really must. Isn't it incredible how colour is largely ignored or written out of history? So glad you discovered all this and shared it! A most glorious post and wonderful story, despite the sorrows. Curses! Another book to read! Thank you, thank you, Catherine, for this wonderful post. I hadn't known of this book. Dumas is absolute favourite of mine. I read all the books I could get my hot little hands on in school, but did not know the history of the writer. thankyou! I will have to look for a good bio now to rea up on the man behind my favorite stories.